On TinyLetter, I write personal updates for friends and family. Collision Course is my journalistic newsletter -- I post weekly updates on tech policy, consumer privacy, and the future. If you do Whole30 and don't blog about it, does the month even exist? No added sugar, real or artificial. No baked goods, or junk foods. The thinking is that some or all of these groups impact your general wellbeing, and that you feel better by removing them for a month and "resetting" your body. I don't have any specific health complaints (I'm a relatively healthy 23-year-old), I'm more interested in doing Whole30 to see if any of the above groups are causing me to feel funky without my realizing it. That and enough people have told me that they felt better after Whole30 to make it seem worth a try. I'll report back with updates every few days. I'll tag posts like these with as Whole_30, so you can get all of them in one place. Unrelated to Whole 30 — I have a bunch of plans I can't wait to share with you. Stay tuned. Close to home: Tor is hiring an intern for Summer 2017. If you know Python or Rust, check it out. Freedom of the Press Foundation, where I was a summer intern, is hiring a full-time security engineer. GitHub is hiring a policy analyst who, it looks like, will be doing a lot of writing. In English, we use the same word for I wear/she wears and Wearing Prada is expensive. Arabic has a different word for each, even though they're related in the way that the English words manage and manager are related. This is good, in that there's less linguistic ambiguity. You almost never have the same meaning collision you have in English -- I'm wearing the shirt uses the same word in a completely different context in I find this discussion wearing. This is also bad -- all those different words have to be learned, or at least recognized. There are a few hundred thousand English words, but a few million in Arabic. This is also due to the fact that Arabic is a simile junkie, and there are about 14 ways of saying "love" and over 100 words for "lion." There are only a handful in common use, but the rest are perfectly legal and kosher. When people told me about college, they mentioned that my senior year would be the most fun -- I would be done with my requirements, I would be finding a job, and I would generally be enjoying my last semester of being relatively carefree young adult and undergrad. This... has not been the case for me. It's midterm season, so about the time when I hole myself up and do a lot of writing. Maddie is tootling around rural Jordan, and I'll see you all in a week. Last Monday, I spoke at Gillette Children's, a hospital in Minneapolis, MN, where I had various surgeries as a child. The gait laboratory there turned 30 last Monday, and I had the pleasure of spending the day with them, and of being there when they announced a $1 million donation, which will go toward research and development. As the article notes, "The funds will make it possible to advance our world-renowned gait and motion analysis research and equip our facility with the very latest technologies." I was glad to play my small part in the day, talking about the impact Gillette surgeries have had on my life. As I said in my talk, the surgeons and staff at Gillette had a huge impact on my quality of life. I spent the last four months traveling around Israel and Palestine, and it's largely thanks to their care and support that I have both the ability and the confidence to do so. I'm in Buenos Aires for another two days. It's been a great fortnight, with good food, excellent company, and amazing surroundings. I added 10,000 words to the manuscript and got to see a little bit of South America, where I've never been before. I had a much longer introspective written, but decided that nobody needed the word vomit and that it's better saved in drafts. TL, DR: I think this is going to be an uncertain year -- professionally, personally, and (more widely) politically. Trump, my college graduation, a change in visa status, job searching... But I'll meet it as it comes. The odd years are always more fun than the even years anyway. I fly back to the US on Saturday, and then drop up to Maine for a few days. I've never been, but I'm a fan of the cold and I have a good friend up there. Plus, it's Stephen King territory, so the winter spookiness should be in overdrive. After that, it's back to New York for my last semester. I'll put up some photos of Buenos Aires in a bit, but that's all for now. 'Tis the most wonderful time of the year: when people post their book recommendations. Here are some of the books I read this year with comments and recommendations. I'm copying the style of on Aaron Swartz's excellent Review of Books, with books I particularly recommend up top. The links go to Amazon, but they're not affiliate links. Best piece of fiction I read all year. The story follows a young Hasidic Jew who grapples his love for his religion and his love of art. First-person-child-narrators as a genre often fall flat, but this is done very well. ...And this is the best non-fiction I read this year. An eminently readable account of the past and present of the Pacific Ocean. The stuff-to-come bits feel slightly shoehorned in, but may we all have Winchester's comprehensive-yet-readable writing style. As someone said somewhere in a review, this isn't a who-done-it so much as a why-done-it. I almost went to Bennington College, which is thought to be the basis for the book's Hampden College. A fascinating look into the justice system and public defenders in general, but I found the author to be totally unlikeable, and some of the Amazon reviews take issue with some of the assertions he makes. It's a poor writer who can't write an autobiography where he comes out looking halfway decent. The cast of characters is somewhat unnecessary and hard to keep up with. Worth reading if you focus on the institutional parts and stop trying to keep track of the names. Ticks all the boxes of a biography in terms of comprehensiveness, but something's still missing. Not particularly compelling, which is a shame considering that the source material is exciting and meaningful. A delightfully funny and surreal piece of short fiction. Read in two sittings. Compelling long-form journalism at its best. Shadid is a role-model to foreign correspondents everywhere, particularly in his attempts to understand the region he covers. Fiction at its most brilliant, and most immersive. My go-to recommendation for anyone looking for a "how did we get to today?" primer. A little bit off-the-wall, but an enjoyable autobiography-with-a-twist. Genuine, funny, and conversation. This was written in 1987, and so it lives and dies by its immediacy: on the one hand, it's an honest and compelling look at the people who were on the ground floor of the epidemic. On the other, one of the book's central claims about "Patient Zero" has been disproved. NYU's College of Arts and Science (where I study) did an interview with me back in August, right before I left for Tel Aviv. The interview was a lot of fun, and it went live this week here. To claim that religious differences is a root cause of tension in the Middle East is to ignore much of what’s going on in the region today. Are religious differences irrelevant? Not a chance. ISIS wants to bring about an apocalyptic clash of civilizations. The heart of the Israeli/Palestinian conflict lies in primordial, irreconcilable differences between two groups. Sunni and Shiah Muslims are locked in a sectarian battle to the death. We've heard these sentiments before, but are they true? The more one studies the Middle East and its interweaving political disputes, the more apparent it becomes that differences often have more to do with economics, territory, and regional power grabs than with 1400-year-old theology. Let’s start with ISIS, who continue to dominate news headlines, presidential debates, and Google search trends. While the group is quick to stress their religiosity (something which Western media outlets are more than happy to repeat, largely unchallenged), it’s important to ask how indicative ISIS is of the larger Muslim umma, or community. ISIS’s interpretation of Islam is largely grounded in the Quran, but one which the vast majority of Muslims reject. It’s a bit like Jews and Christians ignoring the sections of Leviticus which ban seafood, wearing clothing made of more than one kind of cloth, or working on the Sabbath. Nobody but the ultra-orthodox would question their religious devotion. Most Muslims have no problem —and no cognitive dissonance— denouncing the actions of ISIS and remaining devout, practicing Muslims. The conflict has also gone through different stages, which point to it being a nuanced conflict with specific triggers and stages rather than one long period of sustained violence. The chart above shows the variation in the death toll since late 2000. What's the cause for the variation? What was happening during the high and low points of this chart? What political decisions were being made? The answers to these questions would give us a better understanding of the dispute, and disprove the idea that it's an age-old vituperative conflict with no solution. The last idea, that Sunni and Shia Muslims have irreconcilable differences, is also one which is not well-founded in reality. This video from Al Jazeera makes the case well. The current chaos in the Middle East "is "about power, not piety. It's a recent phenomenon, not an ancient one — we're talking 40 years, not 14 centuries." Many media outlets looked at Saudi Arabia executing the Shia cleric Nimr al-Nimr and saw it as an example of renewed sectarian tensions, since Saudi Arabia is a Sunni country. But when the Iranian government denounced the killing and the Saudi embassy in Tehran was attacked, that was less a centuries-old conflict playing out than a geopolitical rivalry: for years, Iran and Saudi Arabia have had a tense relationship, with both countries vying to be dominant regional powers. In Syria, Saudi Arabia supports Suuni fighters, while Iran backs the Assad regime, part of the Alawi Islamic sect, which follows a branch of Twelver Shiism. In this context, however, such regional conflicts become less about religious differences and more closely resemble old fashioned proxy wars. If all this sounds complicated, know that entire theses and books have been written on the subject, and this column is primarily designed to make you think about the nuances of the soundbites we hear in the media. Academics, journalists, and indeed anyone who wants to be informed about the situation must shrug off simplistic models of the world and see the specifics. Dowty, Alan (2013-08-26). Israel / Palestine (p. 82). Wiley. Kindle Edition. The Hashemite Kingdom of Jordan, at the heart of the modern Middle East, occupies what has been called "a strategic nexus connecting Asia, Africa and Europe." Its neighbors are Syria, Iraq, Saudi Arabia, Israel, and Palestine, and so it plays a central role in the politics of the region. It remains one of only two countries in the region to have a peace treaty with Israel (the other being Egypt). The nation of Jordan, as we know it today, officially came into being in 1946, but between 1921 and 1946, it was a British mandate. Following World War I, the imperial powers of Britain and France divided land in the Middle East (which had been previously administered by the ailing Ottoman Empire) and created the nations we now as Israel, Iraq, Jordan, Lebanon, and Syria. This mandate system was organized by the League of Nations, the intergovernmental organization founded at the Versailles Peace Conference which ended World War I. Under its auspices, "advanced nations" were to guide and administer "those colonies and territories" which had been ruled by the Ottoman Empire. Why? Because those colonies and territories "are inhabited by peoples not yet able to stand by themselves under the strenuous conditions of the modern world," according to Article 22 of the Covenant of the League of Nations. Britain and France, then, created states and borders which had not previously existed. The historian James Gelvin points to Jordan as an example of how the borders of these new states were sometimes lacking in rationale. "If you look at a map of Jordan, for example," he writes, "you will see a strange indentation in its eastern border with Saudi Arabia. There is no reasonable explanation for that indentation. No river runs through the area, no mountain range forms a natural division between the two states." Serving as British colonial secretary, Winston Churchill drew Jordan's borders at the 1921 Cairo Conference. Years afterwards, he is said to have bragged that he "created Jordan with the stroke of the pen one Sunday afternoon." (1) This much is known, but here's the piece de resistance — the robust colonial secretary, known for large lunches, is reputed to have been drawing Jordan's border with Saudi Arabia when he hiccuped, and his pen moved off the straight line he was drawing, creating the deviation. Some Jordanians refer to the line as "Churchill's Hiccup" to this day. The contrived nature of the state of Jordan's borders has several impacts. But more generally, it's significant that the region doesn't really have a history of nation states. The region was organized into longstanding authoritarian regimes, of empires Ottoman, Abbasid, and Qajar. These empires were often distant, not playing a large role in the everyday lives of their citizens. In short, the Middle East before 1900 was a region of empires rather than nations, where multiple identities were more important than nationalities as we understand them today. When officials and pundits talk about the Middle East, they neglect to mention that many of the region's borders are artificial. When Western pundits question why "they" can't be more like "us", or why they can't all "get along," absolves us from the responsibility the West had in creating some of the problems in the region today. Our action's their reaction, our cause is their effect, to some extent. In the same way that ISIS is a direct result of Iraq's instability following the 2003 invasion, we have to examine how many of the region's longstanding problems can be attributed, in part or in whole, to the artificial borders bestowed on them following World War I. Some of the ideas in this essay come from lecture notes from Arang Keshavarzian's Fall 2015 class, MEIS-UA 750, “Politics of the Middle East," at New York University. (1) Gelvin, James L. The Modern Middle East: A History. Fourth ed. New York: Oxford UP, 2015, pp 202. (2) Ryan, Curtis R., “Jordan” in Politics & Society in the Contemporary Middle East. ed. Angrist, Michele. Colorado: Lynne Rienner Publishers, Inc, 2013. Print, pp 336. (3) Lewis, Bernard. The Crisis of Islam: Holy War and Unholy Terror. New York: Random House Trade Paperbacks, 2004. pp 16. NYU Local is an independent news site at NYU. I write for Washington Square News, NYU's independent student newspaper. Note: this is a personal blog and I'm writing here in a personal capacity, outside my position as Opinion Editor with WSN. In one of my first journalism classes at NYU, my professor organized a short panel and Q&A on the subject of diversity in journalism. One of the speakers referenced this 2009 NY Post cartoon comparing Obama to a dead monkey. Talking about how such a racist cartoon saw the light of day, the speaker highlighted the lack of reporters of color occupying high-ranking positions in the newsroom. "There weren't enough voices in the upper echelons of the paper stopping that cartoon," Frankie Edozien, the speaker, said at the time. "Nobody was saying 'this will cause you a problem.' People in privileged positions have to be aware of their blind spots." NYU Local published a profile of a disabled burlesque performer at NYU. She has the same disability as me — cerebral palsy. Initially, she seems like the typical NYU student. Coffee in hand, sitting in the Tisch Lounge, consistently distracted by various friends yet still somehow getting things done. But then she gets up and saunters across the room to the door. It quickly becomes clear through how she walks that she is not like the rest. Is she drunk? Injured? Winner of an award for clumsiness? Hey, it's really obvious that this student walks capital-D Differently. She's at NYU and an arts student and interesting or important enough to be the subject of a profile, but the most important thing you need to know about her —beyond the coffee and being easily distracted— is that she is "not like the rest" because of how she walks. We're even treated to the writer's stream of consciousness, her guesses as to, jeez, what is wrong with her? The jibe that physically disabled people walk drunkenly is nothing new, but it's still completely out of line for NYU Local to publish it. NYU Local and the WSN have long been rivals. We're competing in the same space to be NYU students and professors' first call for NYU news -- I get that. 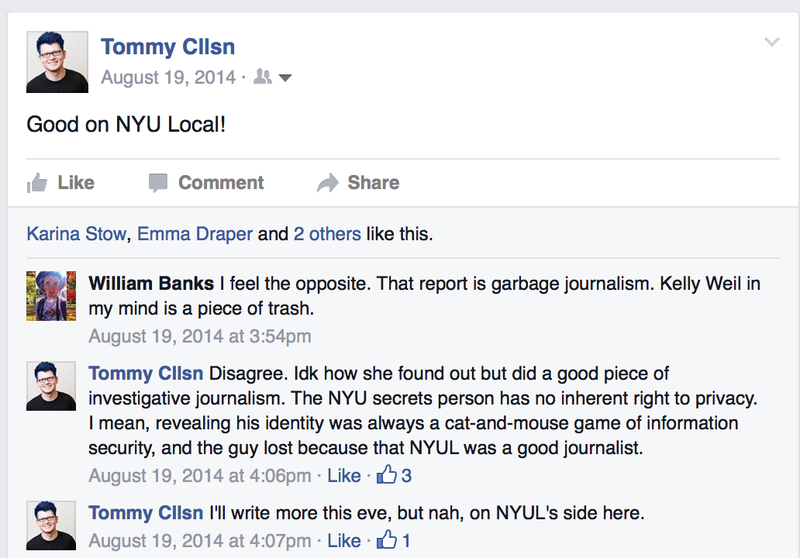 Back in August 2014, I commended them on a story about the NYU Secrets admin. I'm happy to give them credit both here on this blog and on social media when they do right. But when they screw up, I'm gonna call them out on it. Those lines should never have made it into the final version. I don't have any insight into the internal workings of NYU Local, so I don't know how many people read that piece and gave it the green light. I also don't know how many people with disabilities are on senior staff at the news site. But I guess the answer to the second question is zero. I genuinely can't comprehend how someone who knows people with disabilities (as friends, not as subjects of profiles -- y'know, real, complex people with lives outside our drunk, clumsy walks) could have okayed that piece. It reminds me of the chimp cartoon I mentioned above. People familiar with disabilities, who had some insight how this would read to someone unfamiliar with the performer, either don't exist in senior positions at NYU Local or aren't being listened to when they do raise concerns. Editor’s note: an earlier version of this article contained language that was offensive and discriminatory to those with CP. NYU Local regrets the error. Obviously, it would've been better if NYU Local had caught the offensive, discriminatory language prior to publication, but I appreciate how quickly they moved to change the article when it was brought to their attention. I wasn't the one who did —I don't have a rapport with either of NYUL's editors in chief nor the writer of the piece, although I do know the performer— and we haven't spoken directly about any of this. I didn't write this piece as a call for an apology -- I'm just glad the damn line has been taken out. Journalists hold a privileged position, though. We have a responsibility to call out this sort of screw-up when we see it. I hope people call me out when I fall short, and I'll continue to do so when I see journalism that can do better.